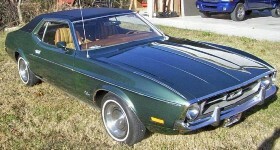 The 1973 Mustang Grande was a special luxury package for the hardtop body style. The Grande options package included a full vinyl roof, body side tape pin stripes, full wheel covers, and a luxury seats and interior trim. This was the last year that the luxury options package was called Grande, in 1974 it was renamed the Ghia after a redesign of the options by the newly Ford acquired Ghia Italian design firm. They were certainly pushing sports. In this 1973 magazine ad, a golfer is shown behind the car. The ad says, "What makes Mustang different is the way it looks, handles, and makes you feel." The ad shows a green Mustang Grande with a white vinyl top. It tells us there are three reasons why the Mustang has been the top selling car since 1965; good looks, good handling, and great feeling. This Blue Glow 1973 Mustang Grande hardtop needs a little help but it shows all the options of a 1973 Grande: full wheel covers, metal rocker panel trim, wheel well molding, pin striping, color keyed sport mirrors, a full vinyl roof. Other Grande options include fog lamps and a luxury interior. The car has the 140hp (at 4000rpm), 302 cubic inch, 2 barrel, V8 engine.